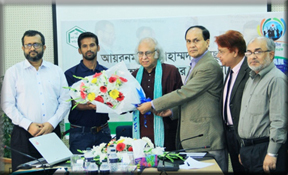 Mohammad Samsuzzaman Arafat, a Bangladeshi IRONMAN title holder was accorded with a grand reception on 19 November 2017 at Palli Karma-Sahayak Foundation (PKSF). In the event, he was made the Goodwill Ambassador of PKSF’s Cultural and Sports Program. 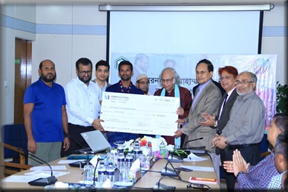 The Chairman of PKSF, Dr Qazi Kholiquzzaman Ahmad, handed over a Crest and a sponsorship check of BDT one lakh to Mohammad Shamsuzzaman Arafat. The Managing Director of PKSF Mr Md Abdul Karim, three Deputy Managing Directors and other Senior Officials of PKSF were present in the reception ceremony. At the outset of reception, Mr Arafat shared his experience gained in the IRONMAN contest, and specially thanked PKSF for patronizing him in this competition. The iconic IRONMAN is the largest participation sports platform which is organized by World Triathlon Corporation (WTC). This competition was to be completed within 17 hours, starting with a 3.8 kilometer swim. 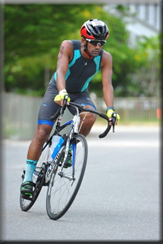 As soon as the swimming was completed, every participant had to ride bicycle through a distance of 180km followed by a full marathon race of 42.2 km. 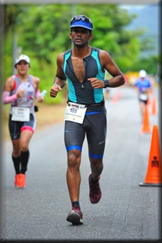 Mr Arafat took only 12:43:28 hours to finish the whole Triathlon. 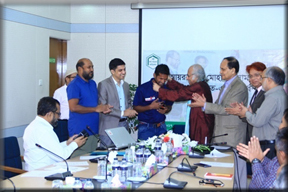 Mr Arafat, a graduate from the University of Dhaka, had crossed the Bangla Channel thrice and went along a total of 1004 kilometer running from Teknaf to Tetulia under the banner of “The Great Bangladesh Run” with an aim to make Bangladesh a sporty nation. 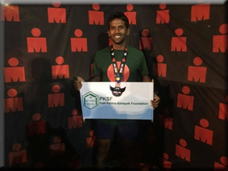 Social Service Officer, Mr Arafat, represented Bangladesh for the first time in the IRONMAN competition held in Langkawi, Malaysia on 11 November 2017. 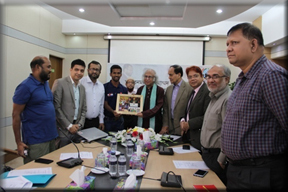 Mr Md Fazlul Kader, Deputy Managing Director (Program) of PKSF spoke about the Cultural and Sports Program of PKSF at the ceremony and how the Program of PKSF encouraged such feats. Earlier on 2 November 2017 the Chairman of PKSF Dr Qazi Kholiquzzaman Ahmad handed over the national flag of Bangladesh to Mr Arafat before he flew off to Malaysia to participate in the competition.